Before leaving for the airport, I went to have a look around Havana’s cathedral, a Cuban baroque building, with two vast towers and completed in 1787. Designed by Italian architect Francesco Borromini, it was described by the novelist Alejo Carpenter as “music set in stone” and is one of the oldest in the Americas. Whatever you think about its architecture, I still found the cathedral a peaceful place to get away from the hustle and bustle of Habana Vieux for some time. 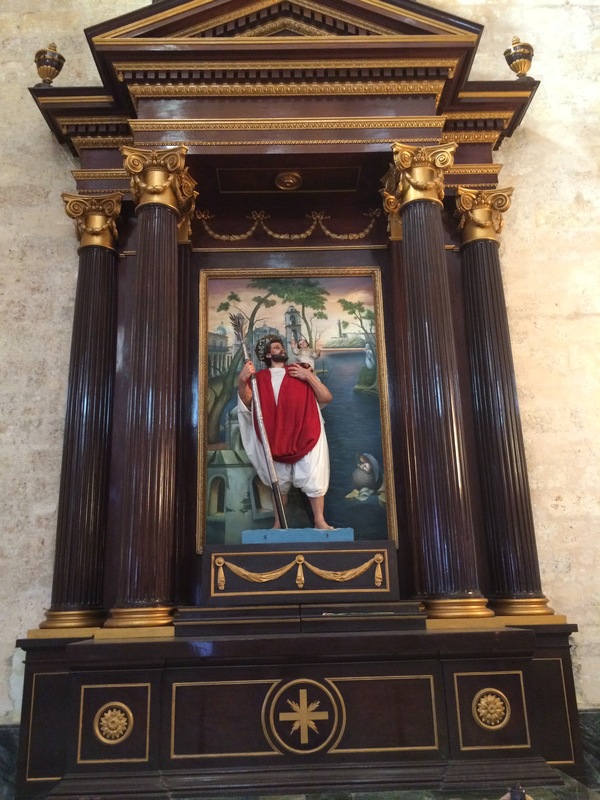 Catholic priests first came to Cuba with Christopher Columbus 500 years (and as I described in an earlier blog the first mass was said in Havana’s present-day Plaza de Armas in 1519). 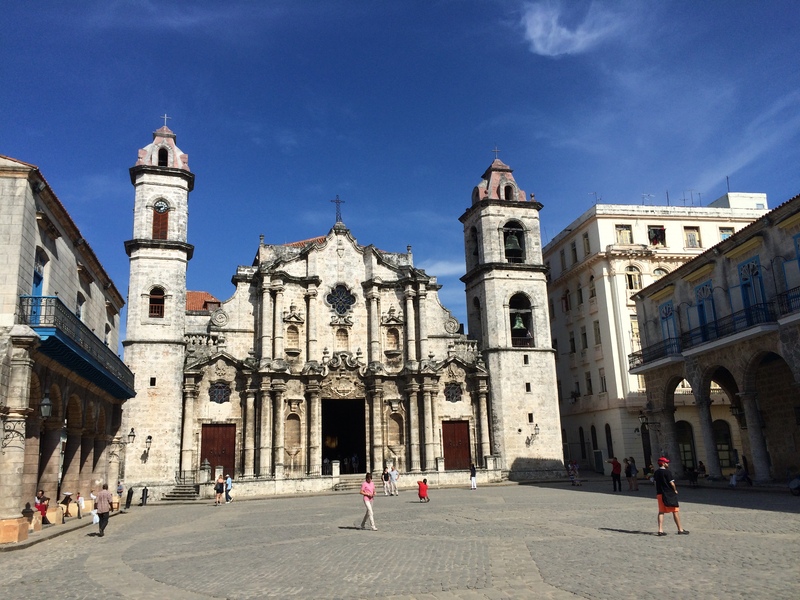 In modern Cuba, the Catholic church has experienced considerable change. Although services were never banned when the state declared itself Marxist-Leninist in the 1960s, around 140 priests were expelled from the country and another 400 left out of choice. Many believers were sent to camps – along with vagrants and homosexuals – where it was hoped they would re-form their thinking and fully commit themselves to the revolutionary cause. Practising Catholics could not hold membership of the influential Communist Party in Cuba and there was restrictions in the types of careers that people could follow, particularly involving certain university posts. In short, believers were seen as second class citizens. But then in 1991, the state changed its constitution from atheist to secular – and Christmas day (dropped in 1969) was restored as a holiday. Catholics could also now join the Communist Party. And then in 1998 John Paul II flew into Havana for the first papal visit to Cuba since Catholicism was imposed on the country five centuries earlier. It was a landmark trip which would have got more press had the Monica Lewinsky scandal not broken and the main correspondents flew back to Washington to cover that story instead. And then in 2012 Pope Benedict XVI preached in Plaza de la Revolucion – the square I had visited in my trip and was usually reserved for speeches from revolutionaries. Since both papal visits there has reportedly been a surge in church attendance in Cuba. Sitting in the quiet of Havana’s Cathedral seemed a logical place to contemplate Cuba’s future, given the role of the Pope in the recent historic talks between the US and Cuba. Things moved on further while I was in Cuba as a high level delegation – including the top Latin America diplomat – was in Havana for talks with the Cuban government. The discussions were apparently constructive and they agreed to meet again. Many around the world seemed optimistic about the President Obama’s announcement in December that restrictions would be eased, but I think things will take longer than people believe. There remains so much mistrust between the two countries and, even if Obama wants something done, he needs to win over Republic-controlled Congress – which seems set on not removing the embargo. And it was only recently when Raul Castro said that he would step down as president in 2018 that the Obama administration was calling for further changes to be made, for example demanding that opposition parties are given the right to operate in Cuba. From talking to people in the country I can’t see that happening anytime soon. Furthermore, some people told me when I travelled around Cuba that lifting the US embargo could actually harm some Cuban producers if it led to a flood of cheap produce flooding into the country. Cubans fought so hard to rid the Spanish from their country in the late 19th century and just when independence was in touching distance, the US came in and stole the show. The country’s new constitution that was settled in Paris in 1901 removed any suggestion that the nationals would have full control over their own sovereignty. At the talks – which no Cuban was even invited to – external powers agreed that the US could intervene in the country’s affairs at any point (the so-called Platt Amendment) and was permitted to build a naval base, the infamous Guantanamo Bay (they had wanted more). The 1959 revolution gave Cuba its first taste of independence after years of corrupt US sponsored administrations. But choosing not to play into the hands of their powerful neighbour has come at a cost and ordinary people have struggled for their basic needs to be met. Poverty is endemic in Cuba. Yet as I saw throughout my trip Cubans are resourceful people and can make do and mend much more effectively than in any other country around the world. There is so much that Cuba can be proud of, which makes it such a pleasant country to visit. No Cuban should need to be homeless as everyone has access to rations and cheap (or even free) accommodation which allows people to sustain a basic level of life. Education and healthcare is free for all. Cultural activities are subsidised – citizens often enjoy free theatre tickets for example. Violent crime is virtually unheard of, people aren’t discriminated on racial grounds and there isn’t the drugs problem that exists in North America. The talks with Washington are important, but they aren’t everything. Travelling around Cuba, you don’t hear everyone crying out for the Americans to come. Yes, many would welcome having access to a sizeable new market and for the possibility for a greater range of goods to be imported. But Cubans got by for so long with the status quo of using what they have, that few would want Raul Castro’s government to sell out completely to the US. Havana’s main international airport is an emotional place. While terminals often are tearful spots, it seemed that Cuba’s main air gateway was more so than others I have passed through around the world over the years. Loved ones were in tears as friends and relatives headed off on flights awy from the island, perhaps they were heading off for good. The scenes I witnessed illustrates just how much of a prize it still is for Cubans to escape to Europe and elsewhere. While I met many people during my stay in Cuba that are passionate about their home, but for others progress is just too slow. But for tourists there are so many reasons to visit this beautiful and varied country. Cuba is quite literally on the cusp of change. Now is the time to visit this wonderful place.